When I first heard about this contest, I thought, "Wow, a contest that will let Number 1's assets shine!" Especially after my talk with David Wells about Swish, I realized how I was not really paying attention to his skills in designing. Furthermore, since he's a boy, I don't think the word "designing" has ever entered my head in association with any of his skills. How do you Roll? Sweepstakes from Tegu on Vimeo. Seriously, the same child who drew the sketch on top of this post actually drew this one first. I have no idea what was going on in his head. I had a feeling that he was capable of doing something more detailed than this but I wasn't sure how to get him there. Was it important to me to get him there? Answer: Heck Yes! Kids don't get art class everyday. I don't think there is anything wrong with letting him learn some of it at home. If I think he has a knack for it, I will try to challenge him and hopefully I won't screw him up in the process. But even though he wasn't eligible for the contest, I really wanted him to think big and try putting his ideas on paper. Seeing a photo of his own creation in grey scale helped him realize that he needed to try drawing in 3D. Thanks MS Word 2010! But the take home factor is this: a contest like this validates his visual-spatial skills and he doesn't get to flex those often enough during his day both at home and at school. If he entered and he didn't win but then saw the winning entry's design, he could compare his drawing to the winner's and learn from it. This is a big lesson. One day he'll go for a job interview and he'll have to show his stuff knowing full well that rejection could be the result. Entering and subsequently losing a contest is a very fun and lighthearted way to experience a little rejection especially since most of the entrants will be rejected. He won't be the only one but he will still have learned a lot. 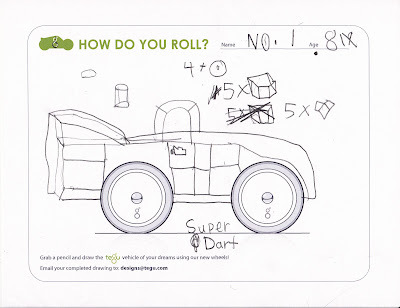 At one point, he drew an SUV! I then used it as an opportunity to remind him of what kind of company Tegu was. Their commitment to the environment and the people of Honduras is very much a part of who they are and thus, we were able to question, "Hey if you wanted to win this contest, would you really win by drawing an SUV?" I am not sure that the company ever talks about SUVs or even gasoline but they sure do talk about energy and about planting lots and lots of trees. We were then able to talk about how to think about how needs affect design - it's not just about creating a cool car. He understood and I was again grateful for such a contest that allowed for so many ideas and important conversations. I don't know much about drawing in perspective but he liked learning about it. We wouldn't have ever even discussed this if it wasn't for the contest and we didn't even enter! Really, do you know of any contests out there that challenge young kids to not just construct something but to really design something? 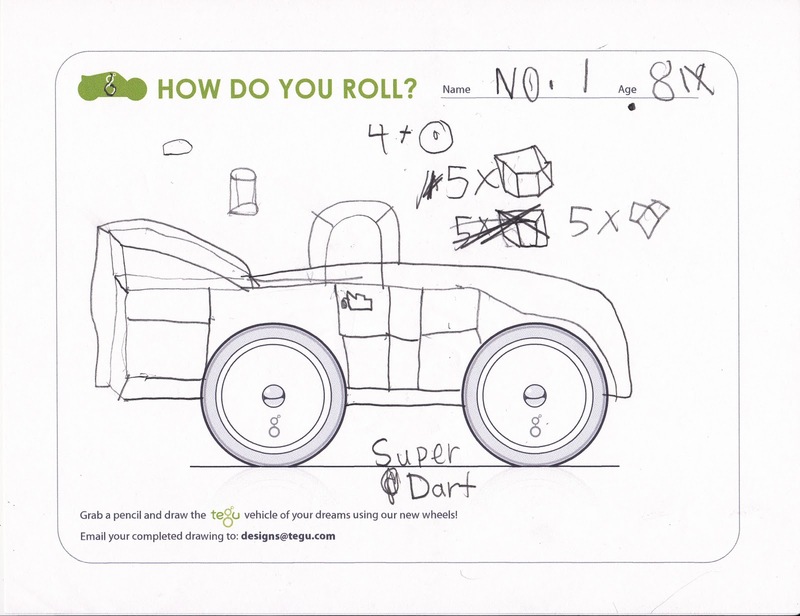 And did you know that the Grand Prize winner will get a chance to design Tegu's next car with their designer Nate Lau and even help name the car? The winning child will even be invited to go to the Tegu factory in the Honduras and watch the new car come off the production line. Anyone can enter the sweepstakes* to get cool prizes but the grand prize is only available to kids 4-12. Lastly, you can still enter without drawing anything but if you do, a glorious opportunity of learning, dreaming, and fruitful discussion awaits you. Above is a video with the designer at Tegu, Nate Lau. If your child is thinking of entering the contest, I suggest you let your child watch this video. I don't think kids even know that there is a job called "designer." It's great to expose them to many different professions at a young age. This post is dedicated to my former teen superstar intern Becky who is the kind of person who definitely dares to win (or lose) big while doing something she loves. Memories of her summer internship reminds me of how lucky I was when I was pretending to know what I was doing as a director of a youth center. At the end of her internship, Becky saved me from failing to fulfil important requirements for a city-funded youth program. Years later, Becky would come to my rescue again when she darted to my house in the middle of the night to watch Number 1 on the day Number 2 was born. Now, as a certified happy and scrappy grown-up (and Fulbright Scholar- go Becky! ), she is helping me out AGAIN but this time, she's giving me tips on toys, namely Tegu. Thanks Becky-Nuna! Thanks for being such a good friend. * Please visit the Tegu site to read about who can enter and what other prizes are being offered. Disclaimer: Tegu was kind enough to send me a few sample blocks and a Maddy Micro, (the orange car with four wheels). I was so excited about them, I totally caved and bought the Tegu Discovery Set (Mahogany) before Tegu's product submission arrived. Other Tegu products that I own were also purchased by me.